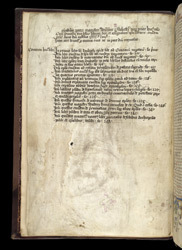 The inscription at the top of this page states: William Ebchester, recently prior of this cathedral church of Durham, had this book made and assigned to the library. This is followed in darker ink by the date 1458, and a request that readers should pray for William's soul. William died in 1456, which suggests that he bequeathed money to pay for it the book, which was completed two years after his death. The next 20 lines list the various contents of the volume.